The Japanese Federation of the Deaf dispatched its President, Mr. Toyoki Ando, and members of the staff to 3 countries in Asia from November 25 to December 3, 2005. The delegation visited Myanmar and Cambodia and discussed future directions of assistance utilizing the Asian Deaf Friendship Fund (ADFF). In Thailand, they visited the Asia- Pacific Development Center on Disability (APCD) and the office of the National Association of the Deaf in Thailand (NADT) for exchanges of views. President Ando and his staff entered Myanmar on November 25, 2005. 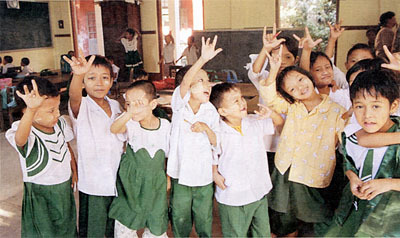 They visited the Myanmar National School for the Deaf in Mandalay on the 26 and the 27. The School was established in 1987 with roughly 50 students. Now the school has 210 students, 140 commuting and 70 boarding. There are 24 teachers, of which 5 are Deaf graduates of the same school. The Mandalay Deaf Association is under preparation for establishment, using one of the rooms of the school as its office. The Establishment Committee, which was recognized by the Myanmar Government in 2003, is tackling such issues as identifying the needs of the Deaf and securing membership, getting help from the school master who acts as consultant. At lunch time of November 27, in front of all the students, ADFF presented TV sets, DVD players/recorders, pencils, erasers and other school items as gifts to the school and students. The TV sets will be put in the boarding houses and will be used for enjoyment by the students. On the 28th, the delegation moved to Yangon, and visited Mary Chapman School for the Deaf. It is a private deaf school with a long history, and there are 367 students and 27 teachers (2 of whom are Deaf). 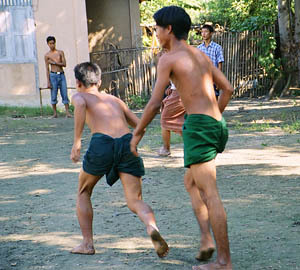 This deaf school in Yangon is now confronted with financial difficulties. The principal of the deaf school in Mandalay also mentioned that the price hike of gasoline has made the running cost of school buses to go up, and to impose a large burden on the school administrators. The ADFF delegation held talks and exchanged opinions with the two schools for the deaf in Myanmar regarding possible forms of future aid such, as helping them with the cost of gasoline. Future assistance to Myanmar will be one of the issues to be discussed at the Steering Committee of ADFF in March. President Ando and the JFD delegation visited three countries in Asia from November 25 to December 3, 2005 for on-site inspection and research on possible targets of assistance by the Asian Deaf Friendship Fund. They also visited the Asia-Pacific Development Center on Disability (APCD) and the National Deaf Association in Thailand while in Bangkok. The party visited APCD in the morning of the November 30. APCD was built by the cooperation of the Governments of Japan and Thailand, with the basic concept of assisting the empowerment of people with disabilities, through such activities as information exchange and training. In APCD, there are rooms where international or local disability organizations can hold offices. APCD also has training rooms, meeting rooms and boarding facilities. The APCD is expected to play a leading role in the Asia Pacific. In the afternoon, the party visited the office of the National Association of the Deaf in Thailand, and met the new president, Mr.Yongyut Borrisuth and other members of the board. They discussed how to carry out the ADFF Scholarship project, and the prospect of future international cooperation in Southeast Asia. Under the new leadership, NADT seemed determined to have a more democratic organization.